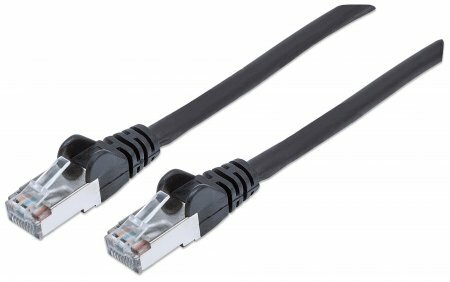 Intellinet High Performance Network Cable - S/FTP 26 AWG, CAT7 Raw Cable, CAT6a Modular plugs, 15 m, Grey, Retail Box, No Warranty. 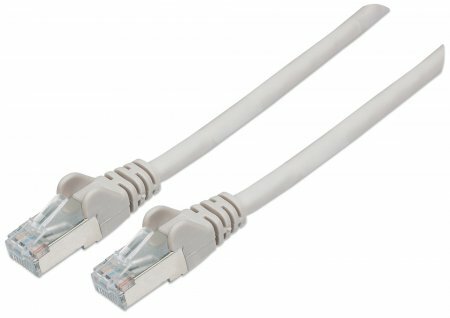 Cat7 raw cable with Cat6a modular plugs gives the best performance for your network infrastructure.As there is no official, agreed-upon standard for the Cat7 plug, Intellinet uses the highest official TIA/EIA-approved components to give you the best specification available. Intellinet High Performance Network Cable - S/FTP 26 AWG, CAT7 Raw Cable, CAT6a Modular plugs, 5 m, Black, Retail Box, No Warranty. Intellinet High Performance Network Cable - S/FTP 26 AWG, CAT7 Raw Cable, CAT6a Modular plugs, 3 m, Black, Retail Box, No Warranty. Intellinet High Performance Network Cable - S/FTP 26 AWG, CAT7 Raw Cable, CAT6a Modular plugs, 1 m, Black, Retail Box, No Warranty.